This last argument is persuasive to many people, especially because the Thirteenth Dalai Lama, in a 1912 treaty with Mongolia of which the original is lost, reportedly declared Tibet to be independent. Still, it is not as conclusive as it might appear, since large parts of China were also in effect autonomous during the first half of this century—Qinghai, for example, more or less governed itself under Ma Pufang during the same period. But this could be seen as a consequence of the weakness of the then Chinese government, beset by Japanese invasion and wracked by civil war; it was not necessarily a proof in itself of separate political status. Ma Pufang apparently did not see himself or his realm as historically or culturally distinct from other political entities within China. October 1, 1987. Tibetans in Lhasa erupted in protests against Chinese occupation. 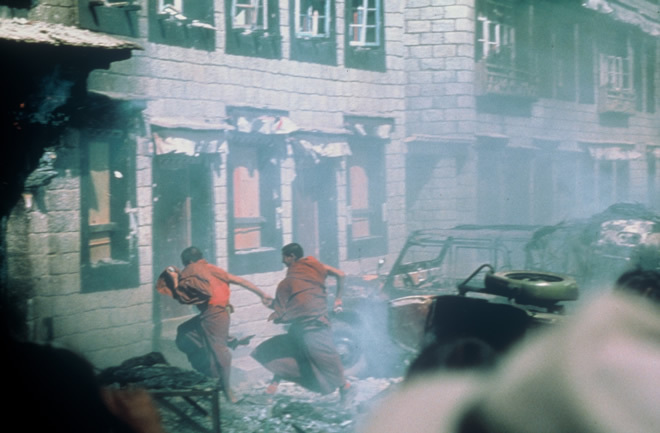 Two tourists, John Ackerly and Blake Kerr, were in Lhasa, photographing the uprising and the wounded. © John Ackerly. Images courtesy of John Ackerly. As far as one can tell from abroad, economic development has led to a surge in small businesses—usually karaoke bars and nightclubs, many of which are short-lived and in which much of the trade is prostitution—and has been sustained by the reinvestment of the cheap loans on the money market in Hong Kong. The current urban boom, with its fragile economic base, could in theory lead to a more stable development of the economy but is as likely to collapse once the state finds it can no longer afford to bankroll the loans. 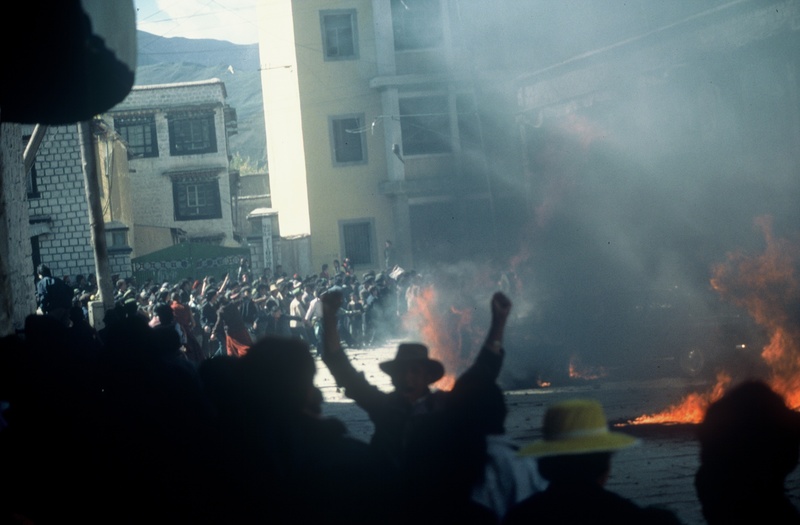 In the meantime a new plutocracy is emerging that is distanced from the majority of its fellow Tibetans, whose opportunities for trade and employment are unlikely to increase until, as the authorities promise, infrastructural development is sufficiently advanced to entice major investors. 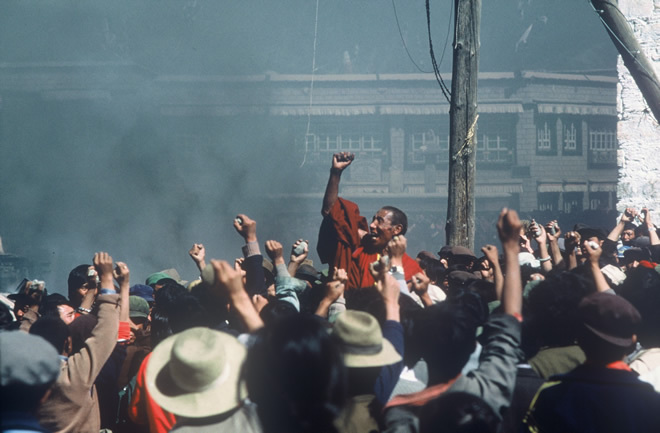 Even then Tibetans might find themselves without increased opportunities for labor, let alone profit, because Chinese workers are likely to be brought in to work on the oil wells and copper mines planned for Tibet. 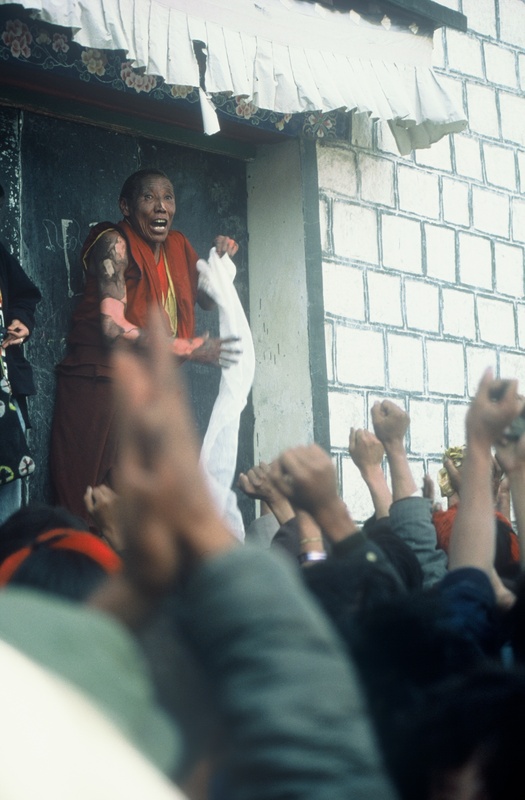 Another difficulty with the general presentation of the Tibetan case in the West is that the wrong elements have been condensed: the exciting things to westerners about Tibet are its exoticism and its mysticism, the colorfulness of its religion, the irrepressible charm of the Dalai Lama, the mystique of the mountains, and so on. Yet in terms of politics these factors are incidental—Kuwait, for example, was not given support against invasion because of the charm of its sheikhs. What should have been condensed in discussions of Tibet, if those involved in creating the images wished to see a political outcome, are the same issues that we consider when dealing with other disputes over colonization or occupation—who holds power, who is not given access to power, what are the political demands and program of the people involved, how close are the representatives of the various groupings to the people they represent, and so on. Header image: © Michael A. Stupa and prayer flags in Ladakh.